Product prices and availability are accurate as of 2019-04-18 11:58:55 UTC and are subject to change. Any price and availability information displayed on http://www.amazon.com/ at the time of purchase will apply to the purchase of this product. 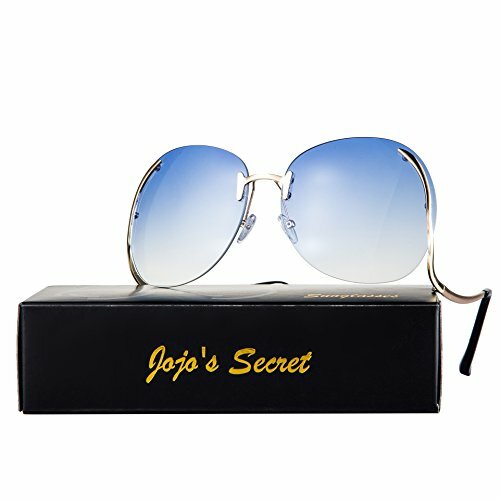 We focus on producing high quality sunglasses,JOJO'S SECRET sunglasses will take good care of your vision protecting your eyes from harmful sun rays. Up to date latest eyewear styles with qualities and designs surpassing similar mainstream product. Take it home and never miss the tide. • JOJO'S SECRET 24 hours awaiting your contact and provide you with the best solution, any questions will be sent to us via email. MATERIAL - Mirror Lens:UV400 Protection Lens.Sunglasses Frame:Made of high quality metal. SYLTE - Unique rimless design,2017 fashionable novel style,It is suitable for any face, show your unique and fashion. SUITABLE - Suitable for shopping, parties, travel or other outdoor enthusiasts. It is also gift packaged ready, making it a wonderful yet practical gift idea for friends and family! SIZE - Lens Height:63MM(2.48 Inches)--Lens Width:67MM(2.63 Inches)--Temple Length--149MM(5.86Inches)--Nose Bridge:18MM(0.71Inches)--Frame Length 153MM(6.02 Inches) JOJO'S SECRET 100% RISK FREE PURCHASE - JOJO'S SECRET customers enjoy 30 Day Money Back Guarantee.Not satisfactory for any reason. You have no risk to try and we will provide you the best service!